Sustainability and environmental protection are two of our company's top priorities. By converting the world's first container ship to LNG operation, we also want to make a contribution to environmental protection, as using liquefied natural gas as a marine fuel helps reduce air pollutant emissions. Because its main component is methane, LNG does not produce any sulphur oxide emissions (SOx) at all. This means that nitrogen oxide emissions (NOx) are reduced by up to 90 percent and particulate matter emissions by around 98 percent. The special financial support granted on behalf of the German Federal Ministry of Transport and Digital Infrastructure (BMVI) for this conversion project shows that we are on the right track here. 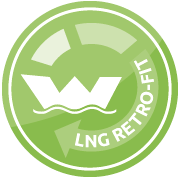 And the WES AMELIE will not be the last ship in our fleet to be converted to LNG. The conversion work is finished! September 2017 - and it's done - after the long planning and conversion phase, the “WES AMELIE” is now ready for its first long journey with LNG propulsion. The first refuelling with clean liquefied natural gas took place at the beginning of August 2017 at the Kühlhauskai quay in Bremerhaven without any problems. The environmentally-friendly marine fuel was supplied via truck by the Hamburg-based company Nauticor. The expansion of LNG in the maritime industry suffers from a well-known „phenomenon" that appears in other areas of shipping as well: the so-called "chicken or the egg“ problem. Applied to the case of LNG this means: without current demand, there will be no reliable LNG infrastructure (or market) - and vice versa. For both sides, the financial incentive is too low and the business risk is too high. The consequence: The currently existing LNG infrastructure (liquefaction plants, storage facilities, bunker facilities) is insufficient, even in high-traffic ports, for comprehensive coverage of ships (so far). 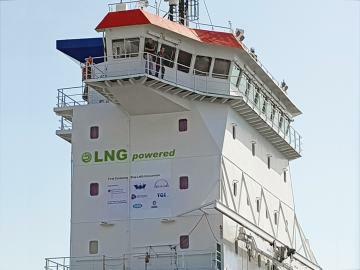 As long as the advantages of LNG conversion cannot be adequately realized due to insufficient supply of LNG, shipowners in the currently tense market phase will not be willing to bear the full investment risk. Therefore, one important goal of our current LNG project is to provide the necessary impulses for creating a solid demand for LNG and hence driving demand for the establishment of a robust LNG infrastructure (logistically and regulatory). We are convinced that the gradual conversion of naval units currently in service will stimulate demand for LNG and thus the absolutely necessary expansion of LNG infrastructure throughout the delivery industry. With the conversion of the "Wes Amelie“ and together with our project partners and the federal government, we want to make a practical contribution to the expansion of environmentally friendly LNG in the maritime industry. When selecting the vessel, explicit attention was paid to achieving a substantial multiplier effect, meaning that possible follow-up projects benefit from this first conversion. Therefore, the "Wes Amelie", a 1,000 TEU feeder container ship, was selected for modification. This young ship was built as part of a larger series, the rest of which are in service primarily in European feeder traffic. 16 identical sister ships are available for the exact same LNG conversion. The MAN manufactured main engines on all 16 ships have been successfully converted to LNG using numerous land generator versions. Thus valuable practical experience and expertise has been collected in advance of the subsequent conversions. But even naval units of other shipping companies will benefit from the practical experience collected during this pilot project. With every new modification, the economic strength of all future conversions will increase. The budget can be successively and significantly reduced for further LNG conversion, eventually making long-term, external financial support obsolete. The conversion of the vessel will be carried out by a German shipyard. The bidding process is currently running. The conversion of the "Wes Amelie" will take 30 days to complete followed by a test run of about 5 days. The launching of the LNG capable vessel is scheduled for early December 2016. The propulsion system of the container ship will be converted to "dual fuel operation". That is: In the SECA zone, instead of heavy fuel oil (and exhaust gas treatment system / scrubber) or marine diesel oil, the use of LNG as the main fuel are made possible. For this purpose, an extensive reconstruction of the entire main engine plant and the installation of an LNG tank are required. With the upgrading of the main engine to LNG operation, the ship meets the emission requirements by the IMO for nitrogen oxides and sulfur oxides. In addition, a significant reduction in particulate emissions and CO2 emissions is achieved. Thus, the ship also the meets the future stringent Tier III emissions legislation by the IMO, whose primary aim is the reduction of nitrogen oxides by 80% by the year 2016. Selected engine and system components are scheduled for delivery in order to convert the previously heavy fuel oil engines to liquid and gaseous fuels. Engine-wise, essentially all components of the combustion chamber and their attachments are to be replaced: cylinder liner including water cooling jacket, pistons, piston rings and cylinder head. This is due to the increase in cylinder bore of 48 cm to 51 cm. Furthermore, injection components will be replaced or added. The pilot oil system necessary for gas operation will be completely rebuilt. To allow for the changed ignition timing with a 51 / 60DF engine, new valve cams and a new turbocharger rotor assembly are supplied. Steering the multi-fuel engine DF 51/60 is more complex than the original running on heavy fuel oil. This makes a conversion of the engine sensors and new instrumentation necessary. Approximately 30 tons of material in total are required for the conversion of the engine. MAN will also deliver the gas control and pilot oil modules, components necessary for gas operation. The main engine of the vessel, type 8L48 / 60 B, was manufactured by MAN Diesel & Turbo. The conversion must be carried out by the manufacturer of the drive system since only the manufacturer can supply the required conversion package. MAN Diesel & Turbo will provide both the required engineering along with the necessary upgrading components. The ship has been classified by the BV during the construction phase. BV is currently the classification society for the ship. It will accompany the upgrade and will oversee in accordance with the regulations and restrictions for ship operational safety and is responsible for the final inspection, certification and technical approval. SMB is the engineering company that will provide the necessary calculations and blueprints for the conversion and installation. TGE will provide the tank and required LNG periphery between the tank and the main engine. A shipyard that, with the support of subcontractors, is able to deliver the required steel works and pipe fitting. For the past two years, Wessels Reederei and the leading machine manufacturer MAN Diesel & Turbo along with TGE Marine Gas Engineering, have been collaborating on a possible conversion of the power units of 1,000 TEU container ships from heavy oil to low-emission LNG operation. Due to the 2015 directive of exhaust emissions by the International Maritime Organization (IMO) for the ECA areas (Emission Controlled Area) North and Baltic Seas, a gradual transition to low-emission propulsion or emission controlled shipping systems is now a main priority of the shipping industry. 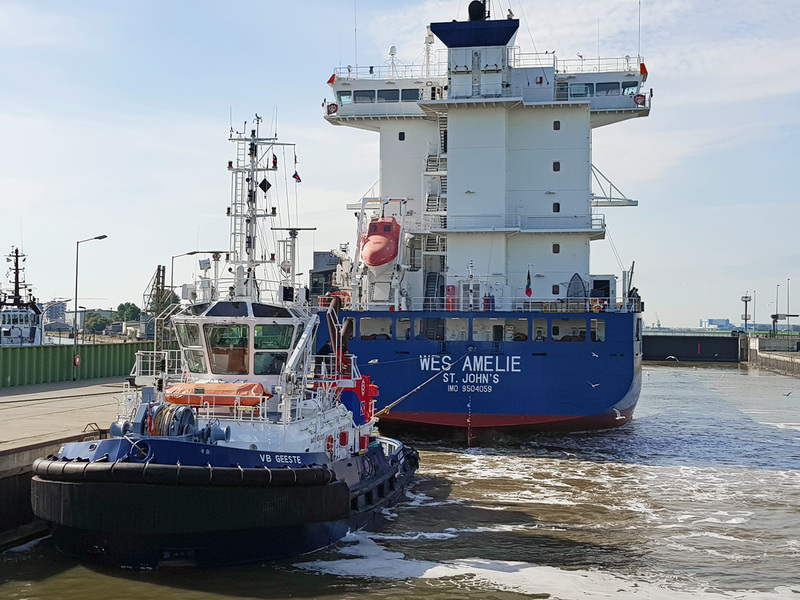 The installation of an emission control system (scrubber), which allows the use of heavy fuel oil, also in ECA zones, has been studied extensively by Wessels Reederei. Upon closer examination, however, we have opted for conversion to LNG operation. Scrubbers have a markedly poorer environmental performance compared to LNG - and they extend the continued use of heavy fuel oil. Therefore, Wessels Reederei has concluded that the course should be set toward environmentally friendly fuels such as LNG. Together with our partners, MAN Diesel & Turbo and TGE Marine Gas Engineering, the technical feasibility of an LNG conversion was analyzed in detail and positively evaluated for our 1,000 TEU container ships. An important challenge of the LNG conversion lies unquestionably in financing. It is considerably more expensive and more complicated than the installation of an exhaust gas treatment system / scrubber. In addition to our own capital - at least for the initial conversion projects - an external investment is of fundamental importance. 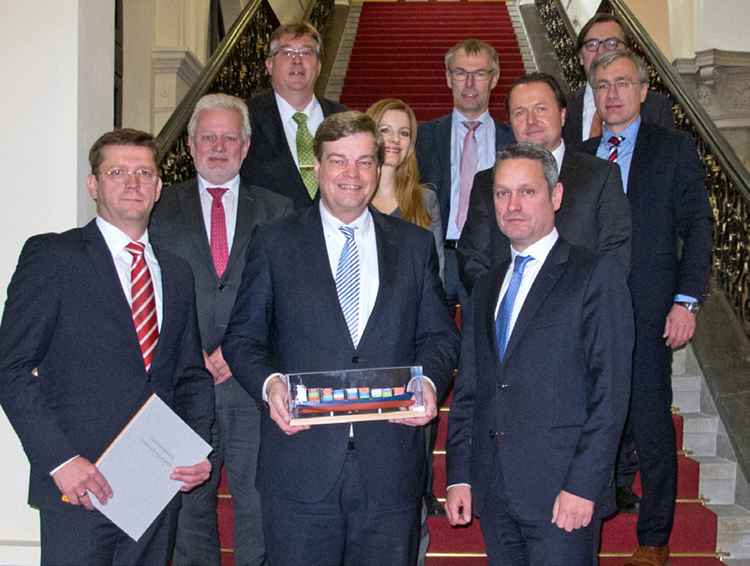 At the "Maritime LNG platform" in Hamburg, which regularly consults with the Federal Ministry of Transport and Digital infrastructure (BMVI), we were informed about possible government funding opportunities for LNG conversion projects in the maritime sector. Funding will be provided in accordance with the mobility and fuel strategy of the federal government, which promotes the use of LNG as an environmentally friendly and low-emission fuel for the maritime sector. With the support of MAN, we persuasively presented a concrete LNG modification project at BMVI. As a result, Wessels Reederei has received official approval for the project from BMVI on 10/15/2015. An important goal of the project is to demonstrate the technical feasibility of using LNG in shipping. At the same time, the project will strengthen the demand of LNG, therefore stimulating the still insufficient LNG infrastructure.